A week before Obama’s visit, the city of Jerusalem has decided to postpone a meeting to discuss establishing a landfill adjacent to E1. 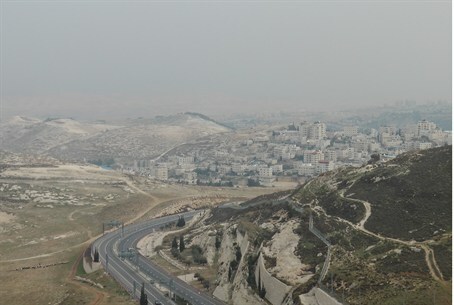 A week before President Barack Obama’s visit to Israel, the city of Jerusalem has decided to postpone a meeting to discuss the establishment of a landfill adjacent to the area known as E1, which connects between Jerusalem and Maaleh Adumim. The meeting had been scheduled for Wednesday. The city of Jerusalem said on Tuesday evening that the meeting was indeed postponed, but denied that this was done following a directive from the Prime Minister's Office. The city said that the discussion was postponed for technical reasons only, because the plan is not yet finalized and not yet ready to be discussed. Israel approved construction in the E1 area after the Palestinian Authority was recognized by the United Nations as a non-member observer state, in a unilateral move by PA Chairman Mahmoud Abbas in violation of the Oslo Accords. Prime Minister Binyamin Netanyahu faced international criticism after the government approved new construction in the area, leading to speculations Tuesday that the scheduled discussion may have been postponed in an attempt to avoid embarrassment before Obama’s visit. The E1 project won approval from outgoing Defense Minister Ehud Barak, but at the same time it was also recently reported that Netanyahu was delaying sending it onward to a planning committee, essentially shelving the project. Hatnua chairwoman Tzipi Livni, who is slated to be appointed Justice Minister in the new government, expressed her objection last month to Israeli construction in E1.